If you're reading this at work, chances are you're sitting in an open plan office. About 70 percent of employees in the U.S. work in such an environment, and after years of companies pushing how wonderful they are, people are finally beginning to accept that they're actually god-awful. In fact, a new study finds that open office plans are even more likely to make cold and flu season worse. Yeah, we know they're supposed to be more friendly and give everyone a chance to chat. And we know all about the theory that they help to break down hierarchies and encourage the free-flow of ideas. But they also have no privacy, and are downright illogical. As a general rule, employees hate open-plan work spaces. HATE. THEM. Here are some very good reasons why. 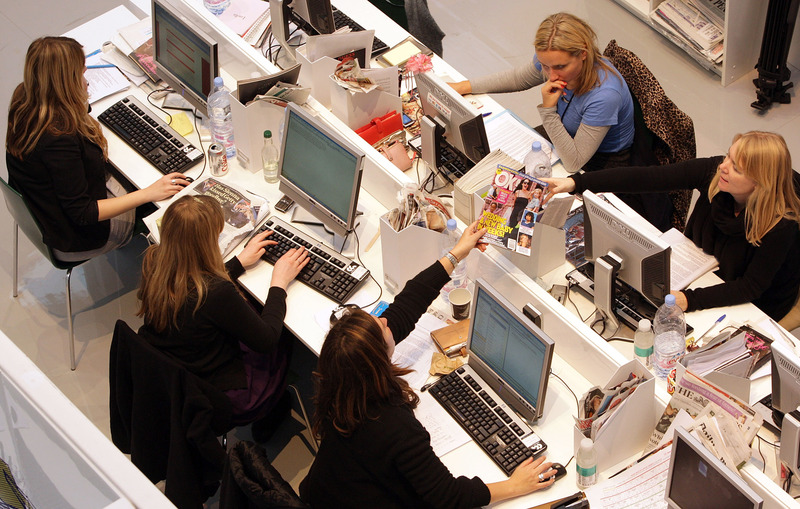 Open-plan office spaces are undeniably noisy, which can seriously impede productivity. Ever tried to speed-read a report while the colleague next to you is yakking on the phone? Yeah, we thought so. A noisy working environment can seriously impede your ability to work efficiently. In fact, some people think productivity levels drop as much as 66 percent in open plan offices. Even if you try listening to music to drown out your coworkers, you'll still be distracted and unable to complete tasks as quickly or to as high a standard as you would if you had some peace and quiet. Swedish researchers have discovered that open-plan offices can result in employees taking more sick days. There are several reasons for this, not least of which is people coughing and sneezing everywhere, and thereby spreading their germs through the air and across surfaces. There's also a good chance "presenteeism" has something to do with it — aka people coming into work even when they shouldn't because it's mega obvious if they take a day off. Not having any privacy in your work environment, or any real space to put your things, is uncomfortable. And people don't work well when they're uncomfortable. Not only can it be awkward trying to do personal things like change your shoes or eat your lunch, but it can be really awkward to just go about the regular tasks that your job requires. When I worked in an open-plan office, I used to absolutely dread making phone calls. First off, I was worried about being judged for my "telephone voice," and secondly, I felt like all of my co-workers were listening in on whatever I said. I also felt awkward about disturbing everyone by talking when they were trying to work. This meant each phone call took a good 20-minute internal pep-talk before I took the plunge. Not productive. Very stressful. Well, technically this one depends on what you mean by "communication." Yes, open plans do increase the amount of time co-workers spend gossiping about what they did on the weekend or gathering around someone's monitor watching the Smithsonian National Zoo panda-cam. But when it comes to actual productive communication — say, discussing work projects or finding solutions to problems — there's actually no evidence that an open plan office is helpful in any way. In fact, there's a good chance it impedes communication because workers don't want everything they say to be overheard by a dozen colleagues. Most people are happier to speak frankly when they can shut the door. Let's face it, open plan office spaces are really just a thinly-veiled ploy to save money on real estate and construction costs. Instead of giving everyone their own office, companies have realized its much cheaper just to pack you all in like sardines. Then they tell you they've done a swanky open-plan remodel that's totally going to benefit you because you'll all feel like much more of a team and it'll break down barriers yada yada yada. Yeah, we're not buying it. A lack of privacy isn't just an issue when you're trying to surreptitiously apply band-aids to your blistered heels under the desk, or quickly book a restaurant reservation on the sly. Studies have shown that breaking down the physical barriers surrounding workers can actually have a negative psychological effect. On the other hand, having a psychological sense of privacy, fostered by having your own office, can boost job performance. People don't like to feel that they're being watched over all the time. Open plan offices can leave employees feeling as though they don't have any control over how they manage their workflow or go about their day. This can lead to feelings of helplessness and frustration. Even simple things like not being able to control the air conditioning or the lighting can cause a massive drop in well-being. Need we go on? In our book, all the camaraderie in the world doesn't make up for the massive toll open plan work spaces take on productivity and employees' overall well-being. Bring back four walls and a door, please.